W.A. ‘BILL’ KORNEGAY, 90, Friday’s Crossing Community of Susan Moore, died Aug. 5, 2018, at Diversicare. He was known for whistling “Happy Birthday” and giving away $1 bills. He was a retired foreman with Blount County and served as a county commissioner for 12 years. 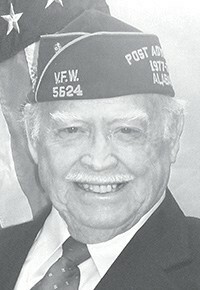 He served with the U.S. Air Force and the U.S. Army. Predeceasing him were wife Wanda Sue Kornegay, parents James Homer and Thelma Louise Thompson Kornegay, and siblings Bessie Ridgeway, Rufas Kornegay, Roscoe Kornegay, Jim Kornegay, Ann Thomas, Bobbie Debter, Bo Kornegay, and John Wayne Kornegay. Surviving are daughters Gwenda (Buford) Maltbie, Janice (Bruce) Blakely, both of Oneonta; sons Jimmy (Wanda) Kornegay, Berry Mountain Community, Steve (Janet) Kornegay, Wilson Chapel Community of Susan Moore; grandchildren Sonya White, Shana (Jeff) Coover, Brett (Rachael) Kornegay, Kristi (John) Randolph, Stephanie Kornegay, Suzanne (Luke) McLendon, Bart (Kala) Blakely, Adam Blakely, Cassie (Brandon) Stifflemire; 11 great-grandchildren; two great-great-grandchildren; sister Louise Long, Snead. Joey Kirby will officiated the 2 p.m. service held today, Aug. 8, at Mt. Zion Church of God with burial at Blount Memory Gardens. Serving as pallbearers are Brett Kornegay, Bart Blakely, Adam Blakely, Luke Mc- Lendon, John Randolph, Jeff Coover, and Brandon Stifflemire. Honorary pallbearers are Sonya White, Shane Coover, Kristi Randolph, Stephanie Kornegay, Suzanne McLendon, and Cassie Stifflemire. Snead Funeral Home directing.